For many years Francis Chan was a darling of the evangelical world. A preacher who would bring the uncompromised Gospel of Jesus Christ without apology. He resonated with the youth greatly who were able to see through the lies of mega-churchdom. The bible however reminds us that we must finish the race. We cannot live on being correct yesterday. The devil is always on the prowl looking for whom he may devour and it is even more important for those with a preaching platform to be careful with our doctrine. There is a reason why those who labor in preaching and teaching are due double honor. It is because they will judged with a higher standard. When Paul says goodbye to the elders at Ephesus he declares that he is innocent of their blood because he did not hesitate to proclaim to them the entire Gospel. The clear inference being that he would be responsible for their blood should his teaching be responsible for them being led astray. An important part of this responsibility is who we choose to stand with. Who we choose to associate with. Who we lend our own credibility to. Our key verse makes this abundantly clear. It is not enough to say that we give instruction in sound doctrine but we must also rebuke those who do not. Many choose to be silent on doctrinal matters that involve other preachers and this verse says they are wrong for doing so. What is worse however, is when we cozy up to wolves and assure our own sheep that there is nothing to fear. When Francis Chan chose to be a speaker at the IHOP Onething Conference two years ago many correctly called him out for it. 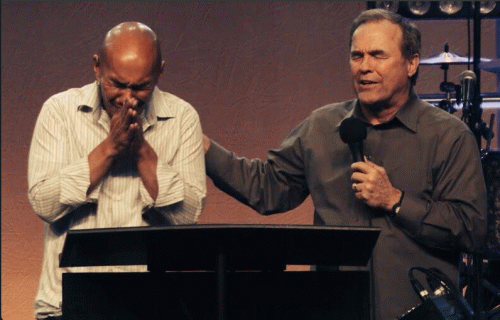 He actually admitted at the conference that many friends had warned him about Mike Bickle, the leader of IHOP. Instead of listening to his friends and advisors, he chose to speak anyway and openly declared at the conference that he "loved Mike Bickle." This despite never having met the man before that day. My sincere hope was that Chan would realize the error of this judgment and that we could all look back on it one day as a simple error; a poor decision. That was until this week when IHOP announced that Chan will again be a speaker at the Onething Conference this year. That means that Francis Chan has chosen to share the stage with one of the greatest heretics of our time twice in less than two years. That is enough for me. Please do not fall for the false argument about eating the meat and spitting out the bone. If the bone is rotten, I have no intention of eating the meat that grows on it. Mike Bickle is a wolf of the highest order. He claims direct angelic visitations. He claims direct audible words from God. He proclaims himself to be a prophet. He surrounds himself with other notable false prophets and embraces some of the most unsound doctrines imaginable openly and proudly. Most who survive the IHOP experience describe it as a cult. Kids are indoctrinated through eastern mysticism and the encouragement of experiential Christianity over doctrinal Christianity. They are heavily steeped in the lying signs and wonders movements and are closely associated with Bill Johnson and the heretical Bethel Church in Redding California. The recent murder of Bethany Deaton revealed only the tip of an iceberg, despite Bickle claiming he knew nothing about any of the details. Strange for a "prophet."